SPOILER ALERT: This in-depth review contains spoilers regarding the mazes and scare zones found at Halloween Horror Nights 2016. It also features images and video that contain spoilers as well. 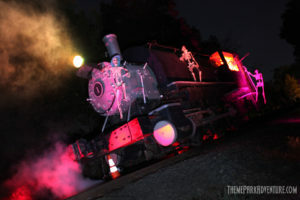 In the wake of our September 17 story regarding the closure of the Los Angeles Live Steamers’ annual Ghost Train event, fans of all walks have expressed their sadness and disappointment online and on social media. Certainly, the disappointment is widespread, as the LALS board of directors surely must have been anticipating when they voted to cancel the Halloween event. 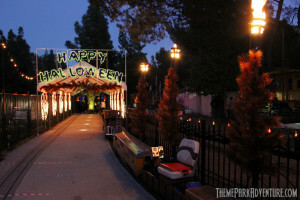 Jay Carsman, a member of the club who originally reached out to Theme Park Adventure, asking us to remove all Ghost Train content on our site, instead voluntarily offered us a very detailed explanation into the club’s decision to do away with this 15 year-old event in Griffith Park here in Los Angeles. 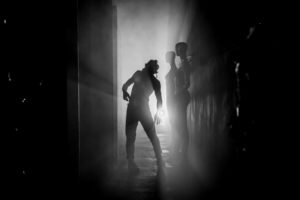 Without a doubt, the single most-anticipated new attraction to come online here in Southern California last Halloween was The 17th Door Haunt Experience. Located in Tustin, just minutes away from Disneyland in Orange County, The 17th Door hit the scene hard, taking everyone by surprise by its sheer size, detail and controversial content. 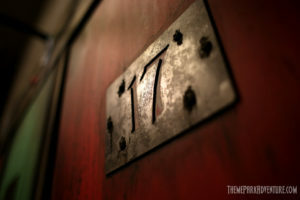 The 17th Door took no prisoners as it thrust thousands of curious guests into the nightmarish world of Paula, a college freshman with lots of emotional baggage. Embarking on her terror trip of bulimia, alcohol and drug abuse, we joined Paula as she made one bad decision after another – and paid for it dearly. Guests fought their way with Paula through solitary confinement, a room filled with live cockroaches, demons in the form of swine-human hybrids, and a myriad of gut-wrenching moments that pushed many to the brink. More than 3,000 visitors at The 17th Door last season tapped out – they cried mercy, because the intensity was simply too much for them to bear. When you stare into the Darkness, the Darkness stares back. 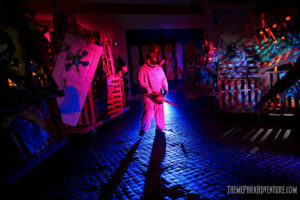 Creep LA burst onto the Southern California Halloween attraction scene last year and wowed fans of all types with its powerful blend of haunted house terror and intense theatrical style. Created by Justin Fix, Creep was a huge success and amassed quite a loyal following in a very short amount of time, from curious horror fans to an impressive list of Hollywood celebrities. The question on our mind was, following a great debut year, what would come next for Justin and his team? In Southern California, new haunts not only need to succeed well in their first year – they need to follow that success with bigger, bolder events to retain their foothold and gain traction for the future. The second year is a huge hurdle to clear – some haunts get so beat up their first year, they don’t even bother returning; others go completely over-the-top and try to be something they’re not, completely ruining the momentum they did have. 2016 brings a lot of change to Halloween in Southern California. Sadly, not all of that change is good news. Case in point, Ghost Train, an incredible family event that has thrilled guests of all ages for the past 15 years in Griffith Park will not be returning. In an executive decision made by the Los Angeles Live Steamers board of directors this summer, it was decided that the beloved Halloween event would not return this year. The word of Ghost Train’s sudden demise came in the form of public announcements from LA Live Steamers Railroad Museum on their official website as well as Facebook page – which fans immediately spoke up against. As a result, those early posts (and a slew of public outcry) were deleted, and a much more abbreviated and under-the-radar announcement is all that’s left on the organization’s website, offering no explanation regarding the situation or decision.